This episode offers a candid discussion with Martha Hodes about the background for her latest book, her daily writing practices, her teaching of experimental history in the classroom, and some advice to graduate students about ‘finding the story’ in their dissertation topics. Martha says that she finds much of her writing inspiration from fiction. Do you find inspiration from fiction? If so, what books would you recommend to other writers? When conducting your own research, do you find yourself looking for good stories to tell? 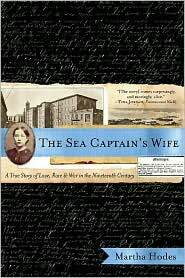 She notes that in The Sea Captain’s Wife she leaves out the sentence that says “I argue that…” because she feels that the argument is evident from the historical narrative. Do you, in your own writing, find the need to explicitly spell out your argument for your readers or do you find that you can write in a manner that makes the argument obvious? In this episode Martha discusses her undergraduate class in “Experimental History.” This previous post links to her Perspectives article on this topic and offers links to the books and articles that she uses in the classroom. This entry was posted in history, podcast, writing and tagged booklist, experimental history, history, Martha Hodes, podcast, research, story, writing. Bookmark the permalink.